Symmetry and beauty- What is beauty? Can we objectively define beauty? Is it related to how symmetrical or asymmetrical an object is? These questions have been explored in numerous papers from different viewpoints, so I will refer you to these through symmetry and beauty. Symmetry in the arts-Again this topic shows up quite frequently and there are many cases of symmetry being shown and studies in the fine arts. For research articles on the subject, I refer you to symmetry in the arts, and symmetry in music.One example I would like to refer to in particular is Leonardo da Vinci’s study of symmetry. 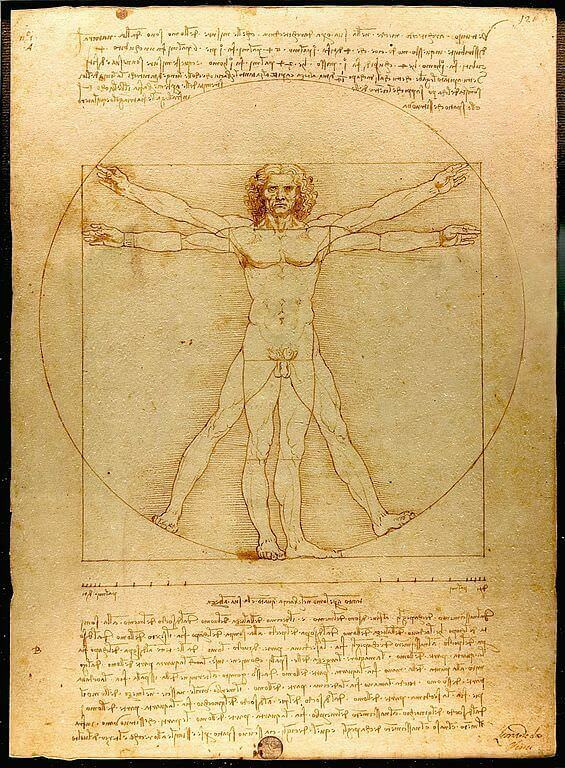 You can directly see his mind viewing the symmetry and the ideal proportions of the human body in the Vitruvian Man which I have posted below Courtesy of LeonardoDaVinci.net. Not only did these ideas present themselves in his work as an artist, he also studied symmetry abstractly, as we will talk about later. Symmetry again show up in the sciences as well. We have already seen how symmetry show up in anatomical studies done in connection with the topics above. We can also see symmetry being used extensively in chemistry when referring to molecules and giving classifications thereof (see symmetry in chemistry). We again see similar characterizations in physics when talking about particles, or when evaluating the appropriateness of assumptions in theorems. Symmetry and even asymmetry seem to have a special place in every mathematicians heart (I may be projecting my own feelings here). In particular, mathematicians study symmetry by looking at mappings of objects to themselves. Note that every object has such a mapping, namely the identity mapping, but every such mapping describes a different symmetry of an object. I am particularly interested in this subject as I wrote my entire dissertation on material related to symmetry (see Bands with High Symmetry and Uniform Bands). As a topic which transcends fields of study, I feel that symmetry is a wonderful topic that everyone can get excited about. However, I don’t feel I can give the subject justice by only covering it in one blog. Hence, I plan on continuing to post on the subject in the coming days or weeks. My purpose today is to provide a motivation for such a course of action, and provide you with an outline of what I plan. I will have the next post of the series tomorrow with a study of symmetry of regular polygons. From there, I don’t plan on talking about symmetry everyday, so I will likely continue the series on symmetry on an every other or every third day basis. I hope you follow along and enjoy. Enter your email to the right in order to the follow this blog.